"A woman like her deserves a fragrance all her own. A scent made just for her. Because she's beautiful. She's powerful. 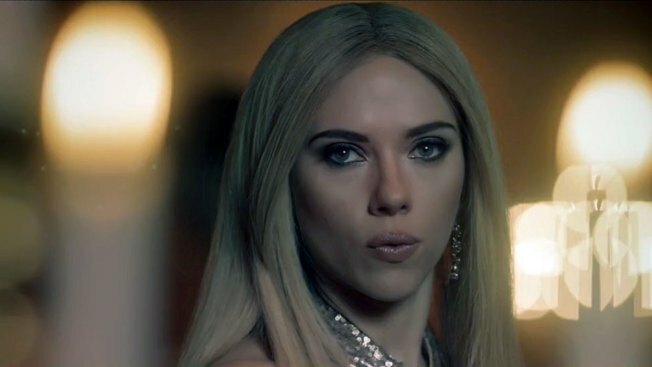 She's…Complicit"
Actress Scarlett Johansson stars in "Saturday Night Live's" "Complicit" fragrance ad parody. Alec Baldwin returned to "Saturday Night Live" this week to play President Donald Trump (though he may not continue to do so for much longer, according to his recent announcement.) And as usual, the show opened with a skewering of the commander in chief's latest governing hiccups and persistent personality quirks. But this week's most pointed political commentary went beyond the cold open, which featured Trump (Baldwin) reluctantly leading a war against extraterrestrial invaders. Rather, it was the short, pre-taped commercial spoof for a fictional women's fragrance hocked by first daughter Ivanka Trump (played by fifth-time "SNL" host Scarlett Johansson) that took a firm stance. "All eyes are on her. She's...Ivanka," a voiceover purrs over b-roll of the elegantly dressed first daughter sauntering through fancy social environs. "And a woman like her deserves a fragrance all her own. A scent made just for her. Because she's beautiful. She's powerful. She's...Complicit." Ivanka is a woman who "knows what she wants" and "knows what she's doing," the ad continues. "She doesn't crave the spotlight, but, we see her," we hear as Ivanka turns her gaze toward a full-length mirror to apply lipstick. Cut to a view of the mirror, and who is reflected back to the world but the president (Baldwin) himself. Because, can someone in Ivanka's unique position remain publicly reticent without effectively becoming a mouthpiece for her father? Earlier this season, "SNL" portrayed Ivanka, along with Melania, top Trump aide Kellyanne Conway and former "Apprentice" star Omarosa, as a somewhat reluctant, or at least self-reflective, participant in the Trump campaign. But this latest sketch appears to send a message that the show won't be letting her off the hook any longer. "A feminist. An advocate. A champion for women," we hear as Ivanka tosses her shimmering blond hair. Cut to the group of three confused-looking women standing nearby: "Like, how?" "Also," the increasingly critical voiceover continues, "I bet when she watches 'Titanic,' she thinks she's Rose. Sorry girl — you're Billy Zane." And of course, Complicit is also available as a cologne "for Jared," Ivanka's husband and top Trump aide Jared Kushner. Later in the episode, "Weekend Update" anchors Colin Jost and Michael Che welcomed fellow cast member Pete Davidson, who recently returned to social media after a hiatus to announce that he is "happy and sober" for the first time in eight years, to give his first impressions of the Trump administration. The show also welcomed the return of Attorney General Jeff Sessions (Kate McKinnon, with impressive hair, makeup and wardrobe) after last week's Forrest Gump-inspired cold open featured the former Alabama senator on a bus stop bench, peppering his life musings with confessions that he'd concealed his relationships with Russian officials. In this week's appearance, Sessions and Democratic Sen. (and IRL "SNL" alum) Al Franken (played by Alex Moffat) revisit their exchange that took place during the attorney general's confirmation hearing. This past Wednesday was designated by activists as a "Day Without a Woman," a call for women to demonstrate their economic importance by not working for a day. While many women instead wore red to work in solidarity, rather than risk their employment status by not showing up, apparently two of the male "SNL" writers took it upon themselves to give their female coworkers a break and take on writing a "Day Without a Woman" sketch for all the women in the cast. Musical guest Lorde performed her songs "Green Light" and "Liability." "Access Hollywood" is owned and distributed by NBCUniversal, the parent company of NBC News, MSNBC, and this station.